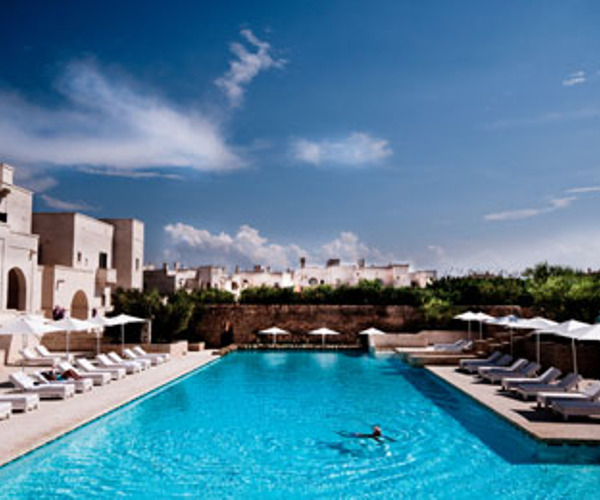 Enveloped by green olive and lemon groves, prickly pears and scented jasmines, the five-star Borgo Egnazia is designed to be not a resort, but a “new idea of luxury hospitality.” Everything from architecture to food to experiences is reminiscent of Apulian traditions, but with a contemporary twist. The lovely Vair Spa, a 1,800-square-meter wellness complex with 12 treatment rooms, is dedicated to using locally sourced elements in decor and treatments, and even the music and spa snacks are authentic to the area. After a treatment, guests can hit the links on the adjacent 18-hole San Domenico Golf Course or enjoy other activities — exploring the sparkling coastline, the Roman town of Egnazia and other villages like the UNESCO site Alberobello — that will make their stay a memorable one. 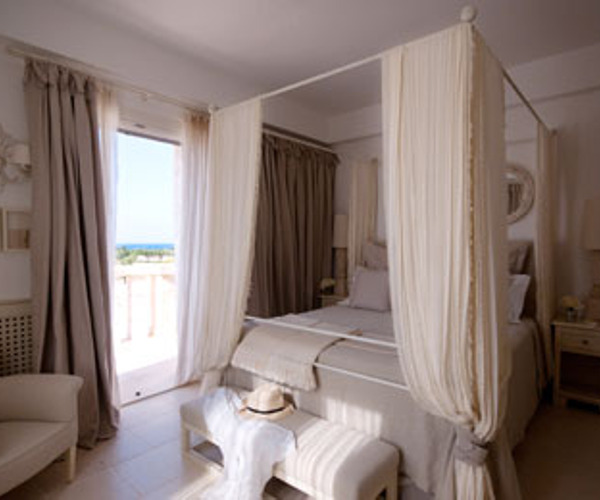 Borgo Egnazia’s Vair Spa features beautiful local materials and furnishings made from area artisans, and white, beige and amber hues are in tune with the country house-inspired design esthetic. Bathed in candlelight, the 1,800-square-meter wellness center has 12 treatment rooms, including one couple’s treatment room, hair salon and two manicure/pedicure stations. In addition, spa pools of varying temperatures are used for Roman-style bathing rituals. All treatments, even mani/pedi services, are designed exclusively for Vair Spa; the Vair SPA Menu of unique services is inspired by the local lifestyle, healing traditions and natural products of the lively region. Treatments include a renewal program based upon the ancient therapeutic ritual Tarantismo and the Tarant massage, which incorporates energetic practices, local dance (pizzica), tambourine (tamburello) playing and traditional alla stisa singing. Dancers and musicians work with Vair Spa’s therapists, doctors and nutritionists to help guests achieve deep relaxation, psychological renewal and the invitation to enjoy life, all of which are major objectives of the spa. We provide a wide range of opportunities and facilities allowing you to pursue all of your preferred relaxation and sports activities. We feature three large outdoor pools (one of which is heated), one heated indoor pool, four tennis courts, alongside a boutique (Bottega Egnazia), a game room, a cigar room and a reading room. In the warm months, you can also enjoy a dive or a sunbath at our two private beaches: the rocky Cala Masciola, equipped with a Water Sports centre and fresh fish restaurant Pescheria Da Vito, and the sandy La Fonte, ideal for families since it features a nice Kids Area. Apulian food is recognized all over the world for its diversity and genuineness. Every restaurant at Borgo Egnazia provides the highest quality in terms of food and service, along with a different mood for each location. Our executive chef and his team create their menus using fresh local materials from our rich soil and our generous sea. Oil, wine, vegetables, fish, meat, spices: they all concur to our vision of fulfilling our cuisine’s two-fold soul: gourmet and traditional. And if you love enjoying a drink during the day, an apéritif at sunset or a toast after dinner, don’t miss the classic cocktails and unique novelties at our bars.